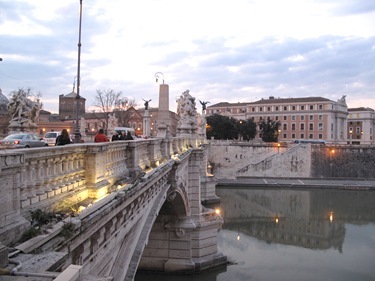 I spent much of this past week (including St. Patrick’s Day) in Rome. 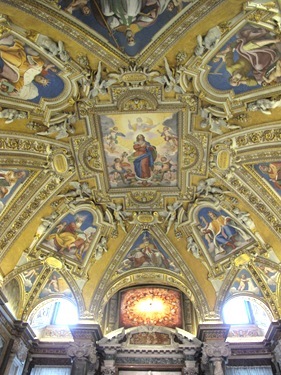 The main purpose of the trip was to attend the plenary session of the Vatican’s Congregation for the Clergy. 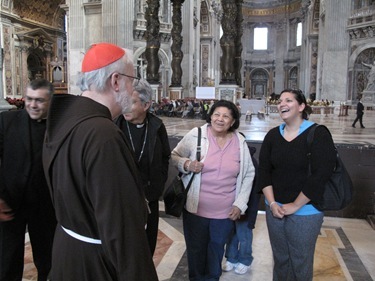 But, as I always do, I tried to find as much time as I could to meet with different groups, particularly people from our Archdiocese living or working in Rome. 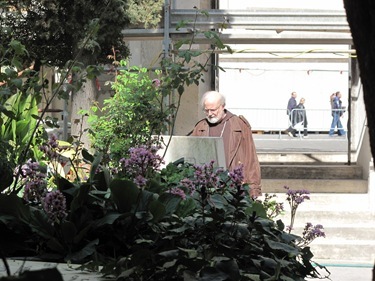 On Saturday we went to the Basilica of St. Mary Major for a Mass celebrating the first anniversary memorial of Chiara Lubich, the leader and foundress of the Focolare Movement. 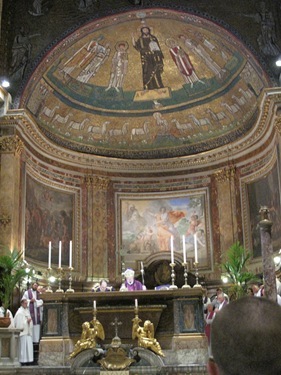 The Mass was celebrated by Cardinal Paul Poupard, the former president of the Pontifical Council for Culture, and the basilica was packed with people, including many bishops and cardinals. 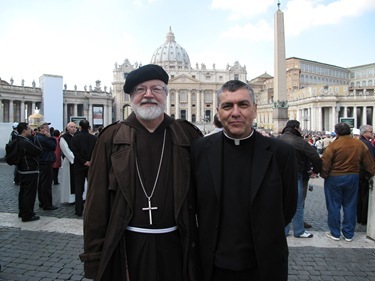 Bishop Alberto Martinez accompanied us to the Mass, as he has always been a consecrated member of the Focolare Movement. It was wonderful to be able to be a part of that celebration. 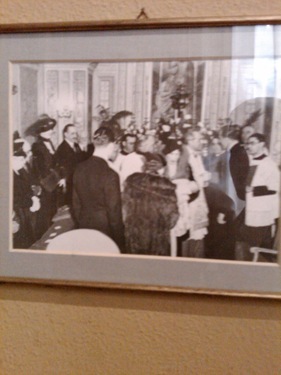 I had known Chiara Lubich personally and often attended the meetings for bishops that she had organized in the past. 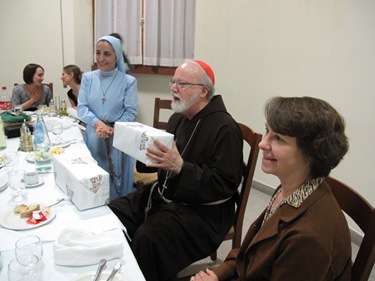 Her vocation began as a Capuchin tertiary in Trento, and even her name, Chiara, is a Franciscan name. 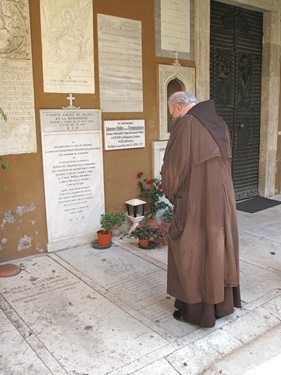 Much of her spirituality, I think, comes right out of St. Francis’ love for the Gospel and his desire to translate that into a meaningful way of life. 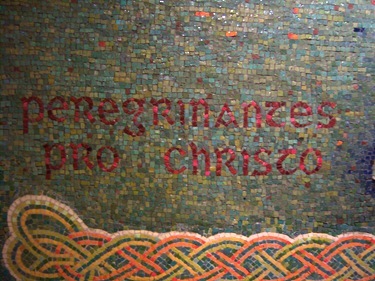 The fraternity of Francis, being Universal Brother, resurfaces in the theology of Chiara Lubich in her great stress for unity—that all might be one, which is the central theme of her spirituality. 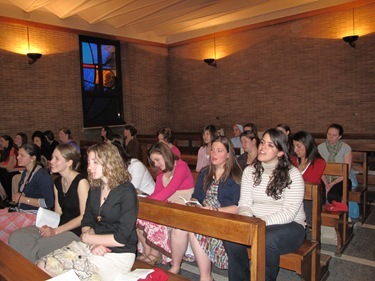 Saturday evening we had a Mass for a group of pilgrims that Sister Olga Yaqob, from the campus ministry at Boston University, organized. Among the participants were Father Jonathan Gaspar’s sister, Amanda, and Beverly Brown, the wife of the president of Boston University. They went on a very spiritually intense pilgrimage visiting many of the holy sites and we were with them for their last evening. 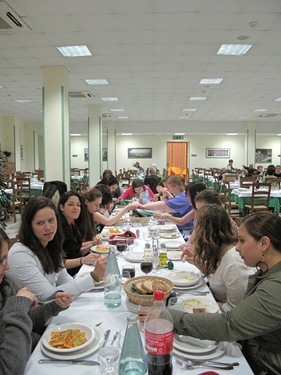 We had Mass and dinner together and afterwards each of the pilgrims gave a testimony of what the pilgrimage had meant to them. 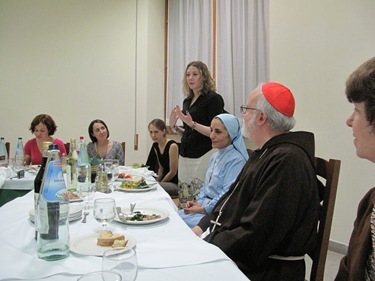 Many of them spoke about the very moving experience of their days in Assisi. At St. Peter’s Square, I ran into a group of students from Merrimack College who were in Italy visiting the Augustinian sites. 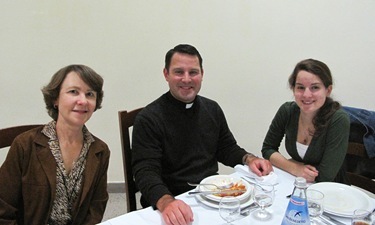 Father Bill Waters, who is the new campus minister at Merrimack, was leading the group. He used to be pastor at Our Lady of Good Counsel Parish in Methuen and before that at St. Mary of the Immaculate Conception in Lawrence. It was an unexpected, but very pleasant encounter. 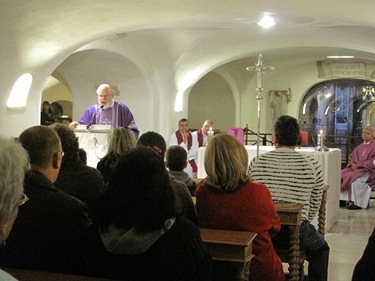 On Sunday, I had a Mass with two American priests serving as chaplains at the Caserma Ederle U.S. military base in Vicenza, one of whom was Father Jose Herrera. I ordained Father Jose back in the Virgin Islands. 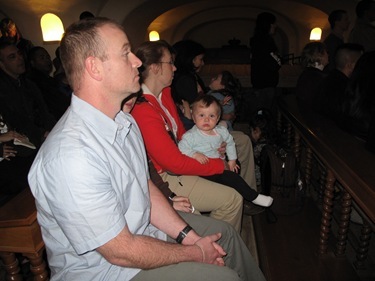 Together with the service members and their families from his chapel in Vicenza, we had Mass at the central altar in the crypt underneath St. Peter’s Basilica. 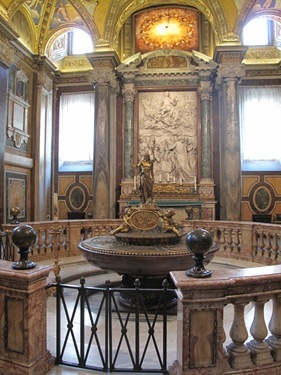 Sitting in the chapel, you have a direct view of the tomb of St. Peter. 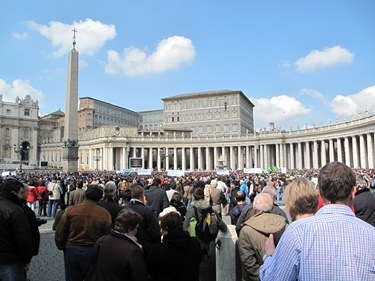 At midday we attended the Angelus with the Holy Father in St. Peter’s Square. On March 19, during the pastoral visit to Africa, we will celebrate the Solemnity of St. Joseph, patron of the universal Church, and my personal patron. St. Joseph, warned in a dream by an angel, had to flee with Mary to Egypt, in Africa, to take the newly born Jesus to a safe place, far from King Herod who wanted to kill him. 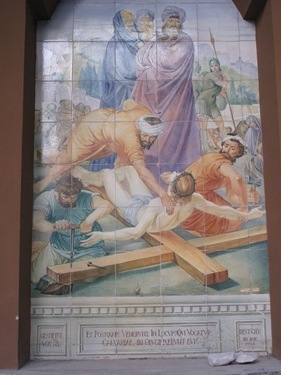 The Scriptures were thus fulfilled: Jesus followed in the footsteps of the patriarchs of old and, like the people of Israel, reentered the Promised Land after having been in exile in Egypt. 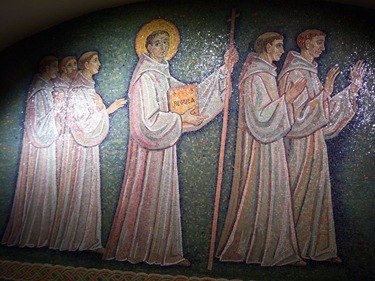 To the heavenly intercession of this great saint I entrust this upcoming pilgrimage and the peoples of all of Africa, with the challenges that face them and the hopes that animate them. 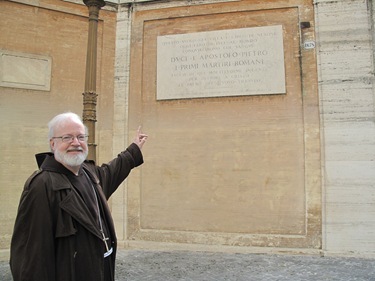 I think especially of the victims of hunger, disease, injustices, of the fratricidal conflicts and of every form of violence that, unfortunately, continues to strike adults and children, without sparing missionaries, priests, religious, and volunteers. 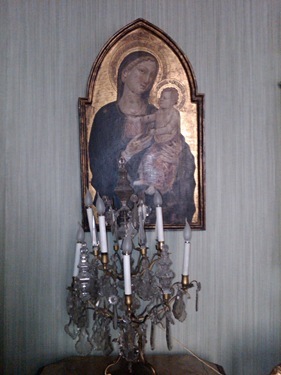 Brothers and sisters, accompany me on this trip with your prayers, invoking Mary, Mother and Queen of Africa. I certainly pray for him and I encourage all of you to pray for our Holy Father as he continues this important journey. 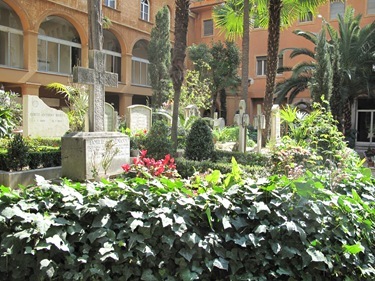 On Sunday afternoon, I stopped in to pray at the German Cemetery located within the Vatican, right beside the Basilica of St. Peter. 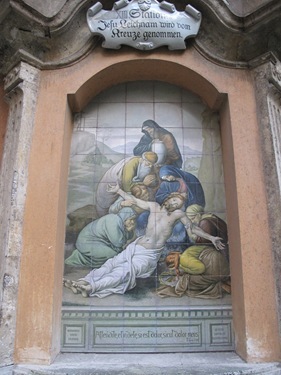 This cemetery had some very moving images of the Stations of the Cross that were being restored. 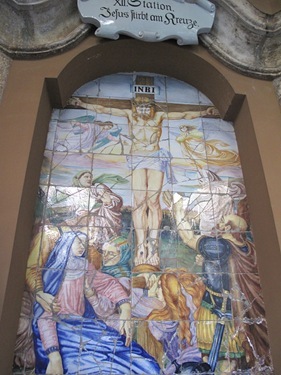 I found them to be beautiful reminders of our Lord’s love for us in his Passion. 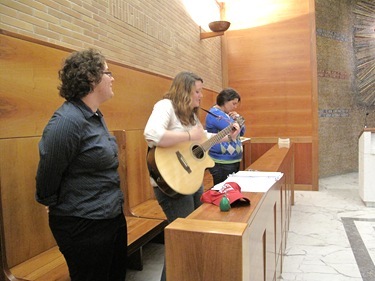 On Monday morning, I was invited by the North American College to say Mass at the station church. 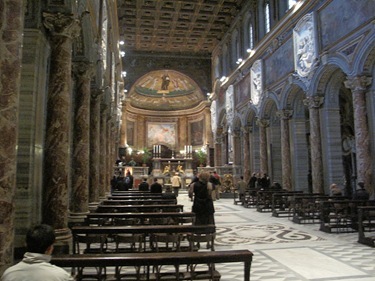 The ancient custom was that the Pope would go to different churches each day during Lent. 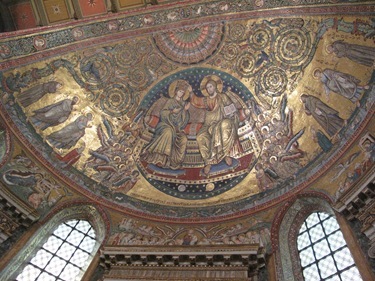 The station church for the Monday of the third week of Lent is the Basilica of San Marco, which was founded by Pope Mark in the year 330 and is near the Capitaline Hill and the forum. 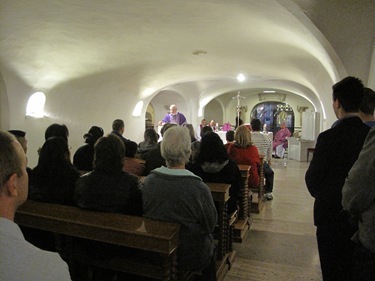 I had Mass there with virtually all of the seminarians from the NAC and the priests from Casa Santa Maria as well as other members from the English-speaking community. 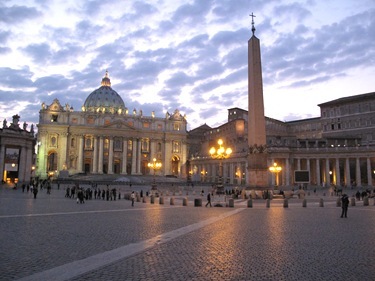 Monday during the day, from 9:00 in the morning to 7:00 at night, we had meetings with the Congregation for the Clergy, one of the two Vatican congregations I serve on. 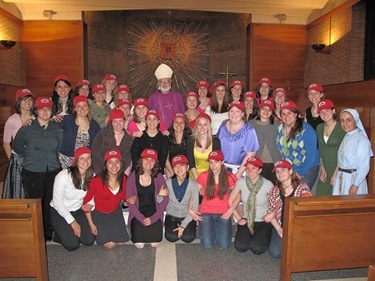 (The other is the Congregation for Institutes of Consecrated Life and Societies of Apostolic Life). 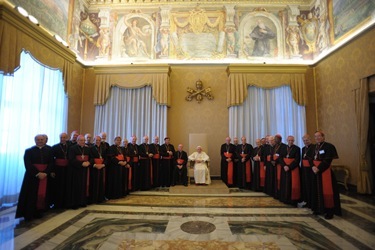 It was the first time I participated in this congregation which is made up of about 20 cardinals and several bishops. 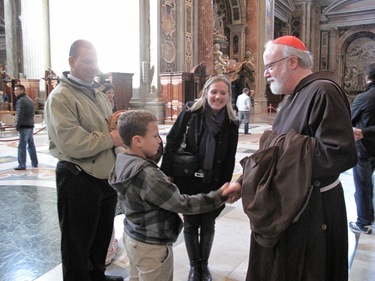 The Prefect of the congregation is a Franciscan cardinal from Brazil, Cardinal Claudio Hummes. 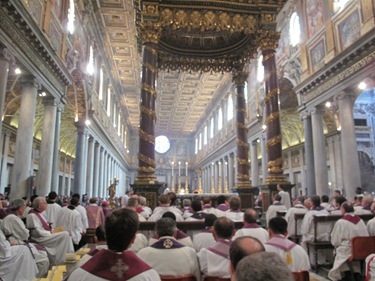 This was Cardinal Hummes’ first session for the Congregation for the Clergy. We discussed a number of issues concerning the priesthood. 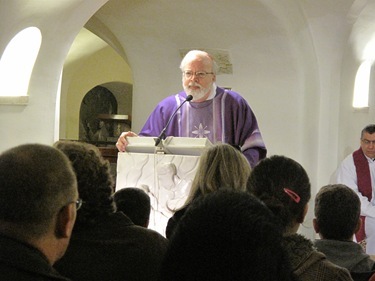 It was particularly encouraging to see that the number of priests worldwide is increasing. 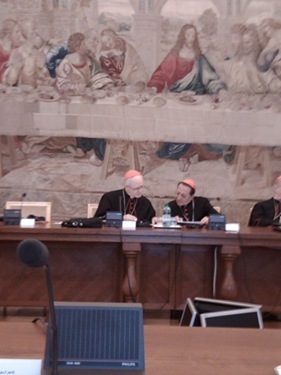 There were very interesting papers presented by two North American archbishops: Cardinal Marc Ouellet of Québec and Archbishop Raymond Burke, The Archbishop Emeritus of St. Louis. Also, Cardinal Jorge Bergoglio of Buenos Aires gave a very fine paper based on the Aparecida Document. 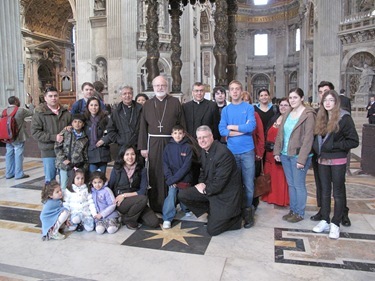 We broke in the middle of the day to meet with the Holy Father. 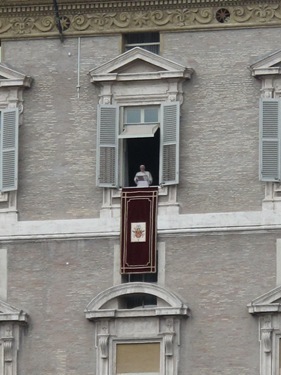 He gave a very beautiful address and spoke with each of us individually. 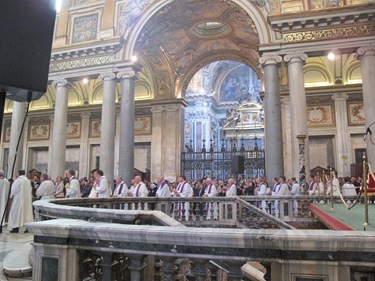 During his address to us, he declared the Year for the Priest, which will begin on the Feast of the Sacred Heart, marking the 150th anniversary of the Birth of the Cure d’Ars and will end next year on the Feast of the Sacred Heart with a large gathering of priests in Rome. 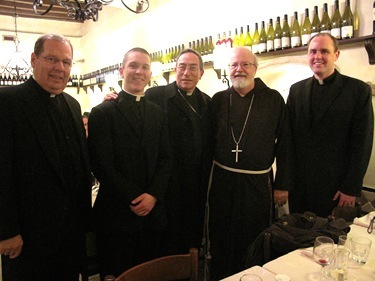 That night we also had the opportunity to gather with our Boston priests and seminarians working in Rome, including Msgr. 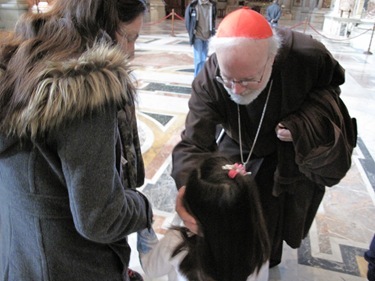 Bob Deeley, who is working in the Congregation for the Doctrine of the Faith and Msgr. 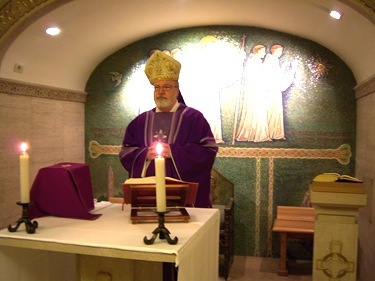 John Abruzzese who is working in the Synod of Bishops. My good friend Oscar Rodriguez Maradiaga also joined us. 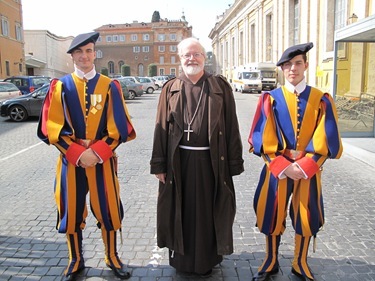 We also met with Monsignor Paul McInerny; Father Derek Borek, who is studying in Rome; and Eric Bennett, a Boston seminarian who is studying at the North American College. 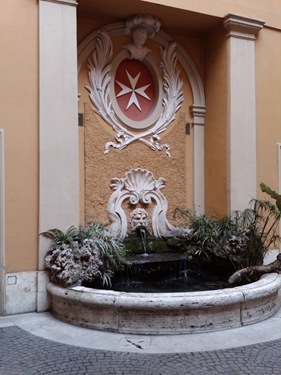 On St. Patrick’s Day we were invited to have Mass at the headquarters of the Order of Malta on the Via dei Condotti. 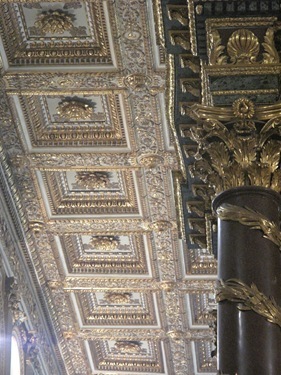 There, we had the Divine Office, during which we prayed in Latin with the fathers who were there. 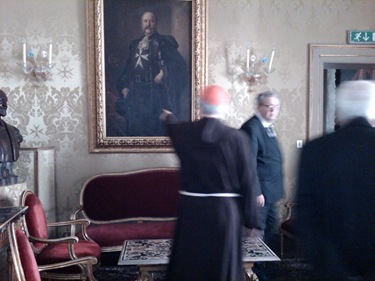 The Knights of Malta have about 50 consecrated members who took vows of chastity, poverty and obedience. Out of those consecrated members come the Grand Master. 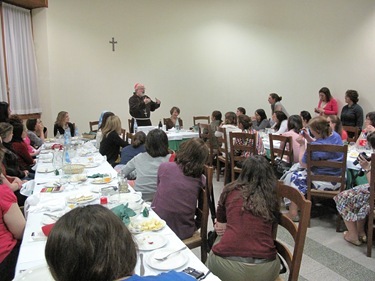 We prayed Lauds, had Mass and then breakfast with Fra Matthew. He served us wonderful English marmalade and bread and regaled us with stories about his service in the army in Belize, where I had also been involved in meetings when I was part of the Antilles Bishops’ Conference. 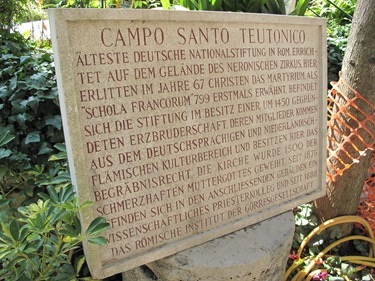 We swapped stories about San Ignatio, which is one of the boarder towns where he had been bivouacked. He was a delightful man and I think he is going to bring a lot of energy to the post. 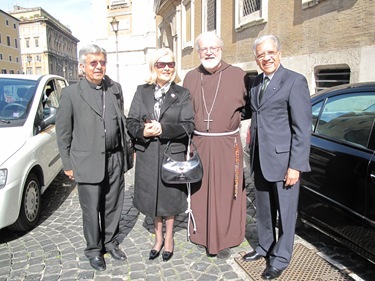 The Order of Malta does so much on behalf of the sick and the poor throughout the world. It is always a pleasure to be with them. 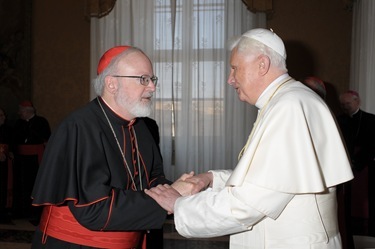 During the evening, I celebrated St. Patrick’s day sharing dinner with Cardinal Francis Stafford, a close personal friend and a very fine bishop. 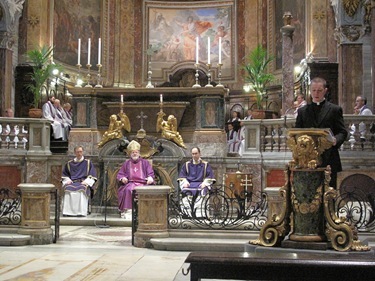 Cardinal Stafford serves the Church in the Apostolic Penitentiary which deals with matters of internal forum and indulgences. We couldn’t find corned beef, so he brought me to one of his favorite spots in Trastevere where we had some great Italian pizza! 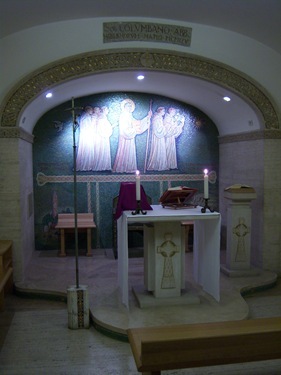 On Wednesday, I celebrated Mass in the Irish Chapel, near the tomb of St. Peter, which is dedicated to St. Columbine. Thursday, we returned to Boston and immediately went to the Annual Jesuit Gala banquet for the Jesuits of the New England Province at the Boston Marriott Copley Place. This year the banquet honored Joseph and Rose Corcoran with the Ad Majorem Dei Gloriam Award. Joe gave an extraordinary talk when he received the award in which he talked about the importance of family and education, [particularly] his support for the efforts of the Church to promote family life and good education. He talked about the 2010 initiative and the two Jesuit middle schools in the diocese: Nativity Preparatory School and Mother Caroline Academy. These two schools are somewhat similar to the Cristo Rey-model high schools. I imagine that some of them go to the Cristo Rey school when they graduate, but others get scholarships because they are prepared very well at these schools—they go to school from seven in the morning to eight o’clock at night. 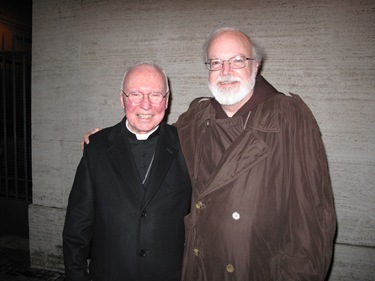 The evening ended honoring Father Tom Regan, SJ, as he ends his six years as Provincial to the New England Province. 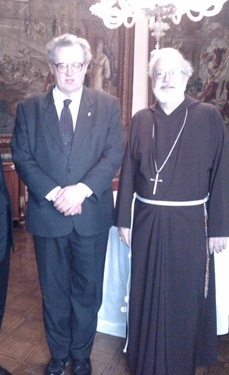 I was very pleased that Archbishop Larry Burke, the retired Archbishop of Kingston, was there. 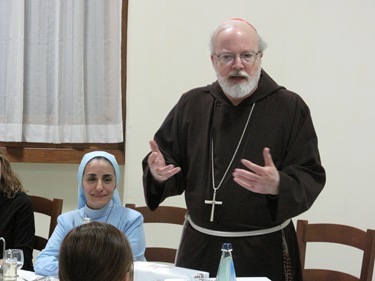 Father J. Bryan Hehir who is the Secretary for Health and Social Services has co-written a letter with Vicar General Father Richard Erikson to all the Pastors and Principals of the Archdiocese of Boston regarding pastoral responses to the economic crisis. 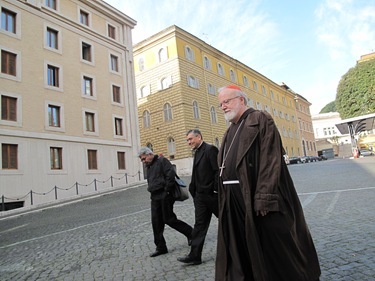 The archdiocese has put together materials and suggestions to help pastoral leaders deal with the needs and the very real and serious problems that many of our brothers and sisters are experiencing as the economic crisis deepens. Please spend time reading those materials available here and share them with others. Finally, I want to encourage you all to participate in a petition initiative that is working to gather signatures to protect the conscience rights of doctors and health care professionals. Last August, the Bush administration approved a regulation prohibiting discrimination against health professionals who did not want to participate in abortions or other morally objectionable procedures based on their religious beliefs. With a new administration in place, the Department of Health and Human Services is now trying to rescind the regulation, and has opened a 30 day comment period that will finalize April 9. So, a conscience program sign-on campaign has been initiated, inviting both patients — that means all of us — and also health care professionals to sign a petition that will be presented to President Obama and members of Congress asking them to keep the current regulation that protects the conscience rights of health professionals. There are two different petitions available at www.freedom2care.org, one for the general public and another with specific wording for health care professionals. As a healthcare professional, I cherish the freedom to care for patients by adhering to ethical standards of care. I do not want the government to interfere with or restrict my freedom to practice medicine without violating the ethical standards I have learned and to which I am committed. I want to remain free to conscientiously care for patients according to time-tested, patient-protecting ethical standards that include, but are not limited to, the Hippocratic Oath, moral and religious principles, the Nuremberg Code and other longstanding principles of medical ethics. I oppose mandating participation in abortion and any unlawful discrimination and intolerant coercion that could force healthcare professionals like myself, or hospitals and clinics, to choose between violating ethical commitments or leaving the practice of medicine. I support laws, regulations and policies that protect and preserve the freedom of healthcare professionals to care for patients without being forced to participate in ethically controversial practices. The federal civil rights regulation noted below is an important tool to clarify and illuminate our civil rights protections, and should be preserved in its entirety. Therefore, I urge the President, officers of his administration and Members of Congress to protect my freedom to care for patients under the ethical principles to which I am committed–by preserving existing federal civil rights laws and the existing Health and Human Services regulation (published 12/19/2008) that implements those laws. 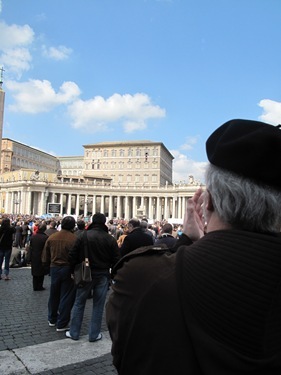 The petitions underscore the importance of maintaining the conscience protection for healthcare workers as the Obama administration is trying to reverse what was a very important regulation to uphold the conscience of Catholics and others who oppose abortion procedures. The Bishops’ Conference is also encouraging Catholics to react to this attempt to rescind the regulation. Cardinal George posted a video on the issue on YouTube that I want to share with you.